Just completed reading a good book ‘Lokmanya Tilak – A Biography’ by A.K. Bhagwat and G.P. Pradhan. This book was written in 1956, to commemorate the 100th birth anniversary of Tilak. The book’s foreword is written by Dr. S Radhakrishnan. This biography presents an in-depth, detailed discussion of Lokmanya Bal Gangadhar Tilak’s life. It provides the reader with a very good insight into the life of the great man. The book starts with Tilak’s early life and formative years in Pune, and delves into a discussion around how his ideals and thought process were getting crystallized in College. The book covers at great length his friendship and differences of opinions with Agarkar. The first few chapters of this book provide mini-biographies of Agarkar and Justice Ranade. This is followed by a description of formation of Deccan Education Society, Fergusson College and establishment of Kesari and Maratha newspapers. The subsequent chapters get into Tilak’s political life as he became the key figure in the Indian freedom struggle for the next three decades. 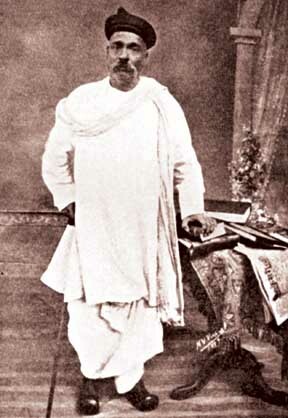 Tilak’s prominent role in the early days of the Indian National Congress is very well described. The difference of opinion between the moderates and nationalists, that led to the ‘split’ at the Surat session is well highlighted and discussed. That Tilak was an excellent lawyer is well known; but it was still great reading through the details of his legal arguments, especially the famous 1908 trial in Bombay High Court. His life at Mandalay and his struggle with diabetes are also discussed. Was interesting to note how he studied German, French and Pali, while in prison…his desire for knowledge was strong as ever in his late 50s. This book also enables the reader to get a better picture of the surroundings in Pune and in other parts of India in that period. These surroundings, along with the global situation in the late 19th century/early 20th century had an important influence on Tilak. It was quite interesting to read how Tilak closely followed the various global geo-political developments in Europe, Russia, America, China and Japan. The book offers good insights into the thought process of Lokmanya Tilak and his personality. His conviction, his forthrightness, his courage, his intellect and his other qualities are presented with plenty of examples. The book is very well researched with detailed references and sources provided for various points. Many extracts from Tilak’s own writings in Kesari are also presented. I would highly recommend this book to anyone interested in Indian History. NOTE – Another excellent source of information about Lokmanya Tilak is the Tilak Museum at Kesari Wada in Pune.